Ovenden and Siddal up for cup! OVENDEN’S Steve Taylor has high hopes of progress as Ovenden make their return to the Challenge Cup after a lengthy break when they host Woolston Rovers in Saturday’s first round (2.0). 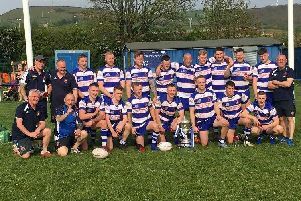 The long-serving Taylor had joint charge of the team with Brett Durkin last weekend as the Four Fields side stayed on course for a second successive Pennine League title with a 38-20 win at Three Tuns. Coach Jake Connor was on Hull FC duty last weekend but the England international’s involvement at his local club has stoked up interest in Ovenden’s return to a competition now sponsored by Ladbrokes. The TV cameras were due at training on Tuesday and Taylor is hoping his men can deliver against a Woolston side who are not their all-conquering force of old. The Warrington outfit were one of the original 10 clubs invited to join BARLA’s National League in 1986. This became the National Conference League in 1992 and Rovers were champions for the first three years and runners-up for the next two. A fire which destroyed their Jubilee Pavilion in October 2002 set the club back a long way and they now play in Division Three of the Conference. Taylor said: “I think we can progress and then we would be hoping for another home tie. Taylor said the 17 players on duty in last Saturday’s win at Hull had done a good job and Connor would also have second row Nathan Smith and winger/centre Luke O’Mara back in contention. Smith has had a back injury while O’Mara was working last Saturday. Taylor believes Ovenden last played in the Challenge Cup in 2010 when they faced Halifax at the Shay. The professional side won 88-10. Taylor said: “We were annihilated but Halifax weren’t a bad Championship side at that time. Ovenden were grateful to get an outing under their belts last Saturday, three opponents having failed to raise teams since their last outing at Sharlston in early December. Siddal chairman Joe McCormack says the club is still in a ‘period of transition’ ahead of the start of the 2019 season at Clock Face Miners on Saturday. The Chevinedge club open their Challenge Cup campaign against the St Helens outfit before switching their attention to preparing for their National Conference Premier Division season. Last year was a mixed bag for a team that had contested the previous three Grand Finals, with coach Gareth Greenwood and a clutch of senior players all exiting. New boss Anthony Murray lasted a matter of weeks before quitting, with club veteran Darren Phillips teaming up with front rower Gareth English to take temporary charge. The pair will remain in control on a permanent basis this year, with McCormack content with their progress. “That was a simple decision to make; we definitely improved under Gareth and Darren,” said McCormack.